The largest city in Jharkhand, Jamshedpur is an appealing destination with its aesthetically planned infrastructure and landscape. Jamshedpur is the quintessential example of the boon of industrialization in a developing nation. It is the largest city in Jharkhand and is majorly maintained by the Tata Industries. The prosperity of the city and its people is clearly reflected in the sparkle of industry and infrastructure. 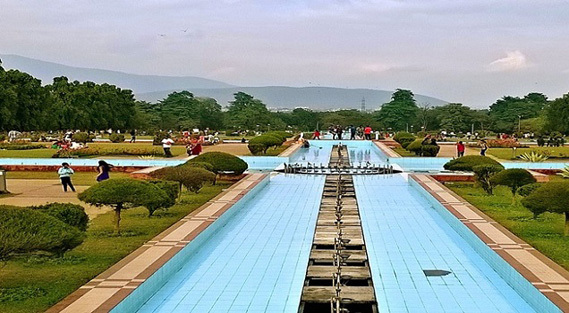 The Jubilee Park is located in the steel city, Jamshedpur. It is a popular destination for all those who wish to have an outdoor picnic, enjoy some outdoor activities and games or even just to have a relaxing day out with friends and family. Popular amongst joggers and cyclists, it is a gigantic park, spanning about 225 acres of land in the center of the city. Within, it has a lake, amusement park, recreation center, fountains and a zoo, amongst other attractions, making it a great place for some fun for people of all ages. This local attraction is a must visit on all tourists' lists. It was opened to the public in 1958, on the occasion of the city's golden jubilee, the 50th anniversary of establishment. This park was originally a gift, to the town of Tatanagar from the TATA Steel Company. While being built under the visionary Jamshetji Nusserwanji Tata, the Vrindavan gardens in Mysore were used as an inspiration. This park also shows off a statue of Mr. Tata and is also known as the "Mughal Gardens of Jamshedpur". The presence of the zoological park, Foliage Par, and Rose Garden is part of the reason why this park is such a famous one. If getting away from the city and spending a quiet day with your loved ones or friends is what's on your mind, Dimna Lake would be the ideal place to spend your day. An artificial lake in the steel city of Jamshedpur, it is located in the foothills of the Dalma mountain range and is famous for its serenity and pleasant greenery. The lake is pretty well-known as a picnic spot with its clear water and scenic surroundings, creating scope for mini treks into the hills, and water activities such as boating, rowing, and jet skiing among many others. In stark contrast with its industrial surroundings, the serene lake is one of the most crucial structures in the area, since it is used as a reservoir to store and provide water for the steel plant, along with being the primary source of water for the city. Over the years, the need for a dam was felt to hold the water in the reservoir, so that it can be used as and when required optimally. The Dimna Dam was conceived to overcome a water deprivation situation in Tatanagar (as Jamshedpur is also known) and surrounding areas. Constructed under the auspices of Indian conglomerate Tata Steel, the dam is built on River Kharkai under the administration of the Mirzadih Panchayat of Jamshedpur. A gorgeous sunrise coming up from behind the hills, with splendid greenery and melodious chirping of birds is what sets this artificial lake apart as a traveller's destination. It is a popular weekend getaway for the local people of Jharkhand, or as a recreational outing for tourists on an extended tour. The road to Dimna Lake will take you on a ride through the undulating but spectacular hilly terrains of eastern India. Hudco Lake is easily accessible from the main city, as it is located in the middle of Telco Colony. This famous lake is surrounded by green fields and hill ranges that attract tourists. The industrially developed city of Jamshedpur is popular for its Sumant Mulgaonkar Park, which is situated just next to the Hudco Lake. This Sumant Mulgaonkar Park is a suitable place for organising picnic. The crystal clear water of Hudco Lake is ideal for boating. There is an artificial waterfall in the park which uses the water of the lake. Tourists can visit Hudco Lake during summers to get relief from the scorching heat of the sun. Moreover, the lake and the park are mainly crowded during weekends. Dalma Wildlife Sanctuary is famous for its forest tourism, but to the residents, it is more familiar because of its wild resident elephants. 'Dalma Haathi' or the 'Elephants of Dalma' is a known and quite fearful term in the Jamshedpur-Puruliya region. Established in 1975 and inaugurated by Sanjay Gandhi, the Dalma forest is home to a horde of animals, birds and tree species as well. Overlooking the shimmering Subarnarekha River, the Dalma hills nestle the dense green forests like an offspring. This ambience of the forest and the odd chance of having a glimpse at the wild animals is what makes Dalma so special among those who love to travel around jungles. Once an untamed natural beauty for acres after acres, parts of this wild forest got shunted when the steel plant was established by JN Tata near the Kharkai-Subarnarekha confluence. However, whatever remains is still large enough to be a paradise for all the native Indian flora and fauna you can think of. Many elephants migrate to this forest every year adding to the crowd, and sometimes they come out into the local villages and suburbs. Travellers wishing to explore a slice of one of India's most authentic forests can take a drive through or even better - spend a night at the rest houses and bamboo huts offered by the forest department. There is nothing better for a nature lover than to spend a night listening to the crickets, the distant, solitary howl of a wild creature and the otherwise overwhelming silence. Among the few true-blue forests of India, Dalma Wildlife Sanctuary offers excellent bird watching experience, exciting in-jungle lodging and spectacular view from atop the Dalma peak which also has a couple of temples you can visit. Located just outside of the Jubilee Park, the Russi Modi Centre for Excellence houses various professional organizations in Jamshedpur. The building was designed by Hafeez Contractor and is considered to be one of the most beautiful buildings in Jamshedpur. The building was formerly designed as the Jubilee Park. It houses archives of Tata Steel, a brilliant representation of its journey to being one of the biggest and most successful industries in the world. The confluence of the rivers Subarnekha and Domohani serves as a perfect picnic spot in the city of Jamshedpur. The place is surrounded by tall eucalyptus trees and verdant greenery which gives it an imposing serenity and calmness. Sunsets at this place create an extremely relaxing ambience and hence should not be missed. Situated on the banks of Subarnekha River, Bhatia Park is a beautiful park with extremely wide space and lush greenery. It is highly maintained with well-laid out grass and flower beds and is the perfect place for weekend getaways and evening rejuvenation. Situated nearby is a Chandi Baba Mandir which can be visited during evenings. Situated in Northern Town in Jamshedpur, JRD TATA Sports Complex is the largest sports complex in the city with a capacity of around 24000 spectators. The compound is lately used for football and athletics mostly; however, it has facilities for archery, handball, martial arts, boxing, shooting, chess, yoga among others. Jayanti Sarovar is a gorgeous lake in Jamshedpur city. Mostly used as a recreation spot, the lake mostly attracts tourists during winter months for rare and exotic birds migrate to the spot. Besides, the premises have an amusement park for kids replete with slides, skating rings etc. The lake also has water fountains and flower beds to accentuate the beauty. Sir Dorabji Tata Park was built by Tata Steel and dedicated to RussiModi so this park was earlier called •Modi Parkê. Later it was named after Sir Dorabji Tata, son of Jamshedji Tata and a massive statue of Sir Dorabji Tata was installed in the park. The park boasts of well-maintained gardens, brilliant water fountains and gorgeous flower beds. Jubilee Lake is a beautiful lake in Jamshedpur city surrounded by a laser light auditorium and a zoo, all of which are managed by Tata Steel. The lake facilitates boating and fishing and is a popular tourist spot in the city. Tribal Culture Centre is a popular tourist attraction in Jamshedpur which preserves the rich culture of the Santhal, Ho, Oraon, Munda and other tribes. The centre has huge sculptures of leaders of the freedom movement like Baba Tilka Majhi, Birsa Munda and Sidho-Kanhu. The gallery is lined with paintings and the inner repository has a variety of antiques and relics on display. St Maryês Church is one of the oldest churches in the city. It is situated in Bistupur in Jamshedpur and is thronged by devotees regularly.